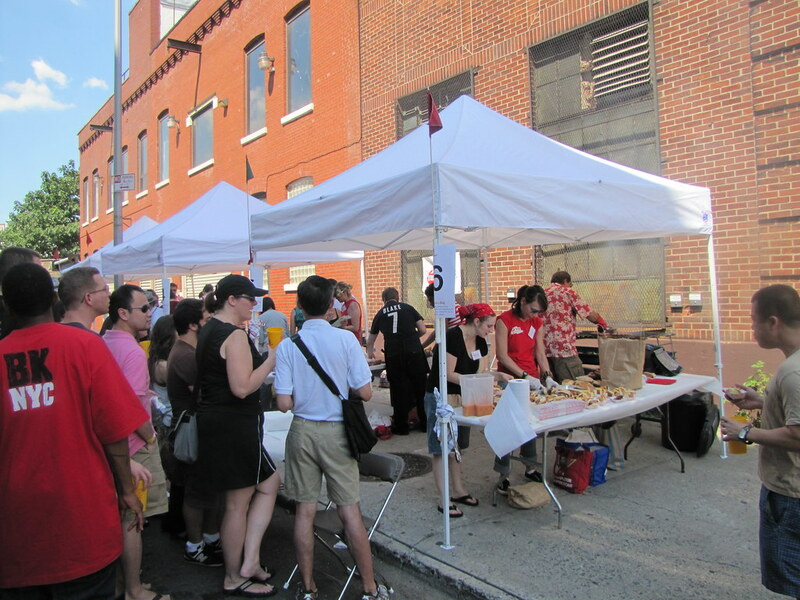 The Sixth Annual Great Hot Dog Cook-Off took place last Saturday, and what a competition we had! 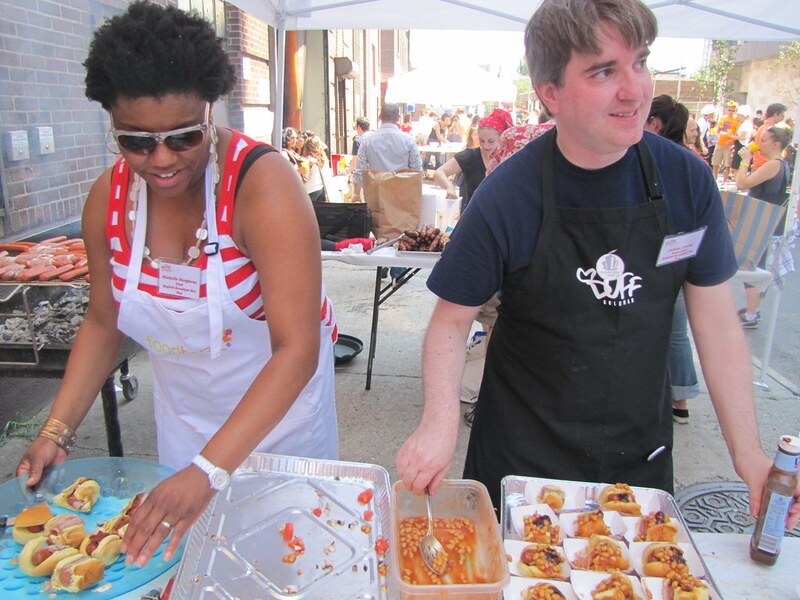 The little cook-off that began in Kara Masi’s backyard has blossomed into a full-blown block party in front of Kelso Brewery in Clinton Hill, Brooklyn. As always, this event was a charity fundraiser for City Harvest, who received all of the proceeds from the 300 ticket sales. 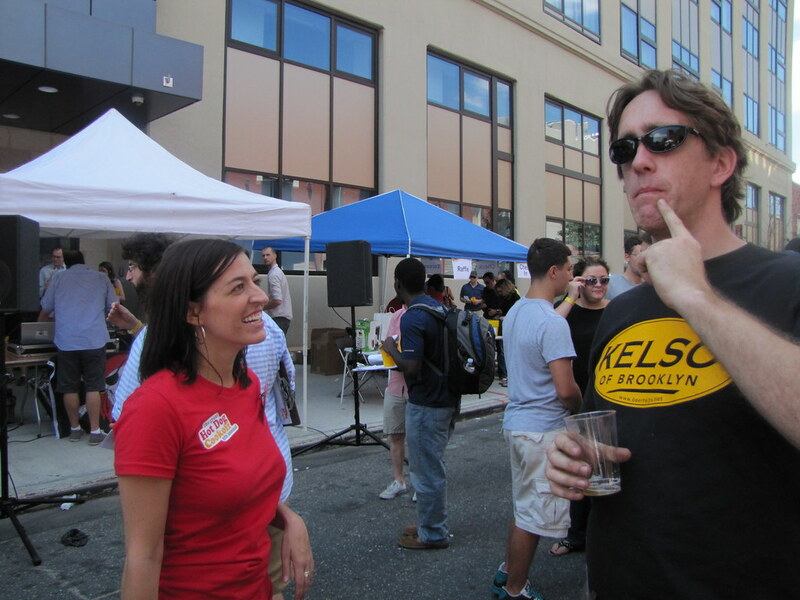 Kelso has been sponsoring the cook-off since the very first year, and last year held it inside (and on the streets outside) the brewery. This year, a deejay, announcer, ice cream sponsor (Adirondack) and hot dog (Hummel) sponsor were added. 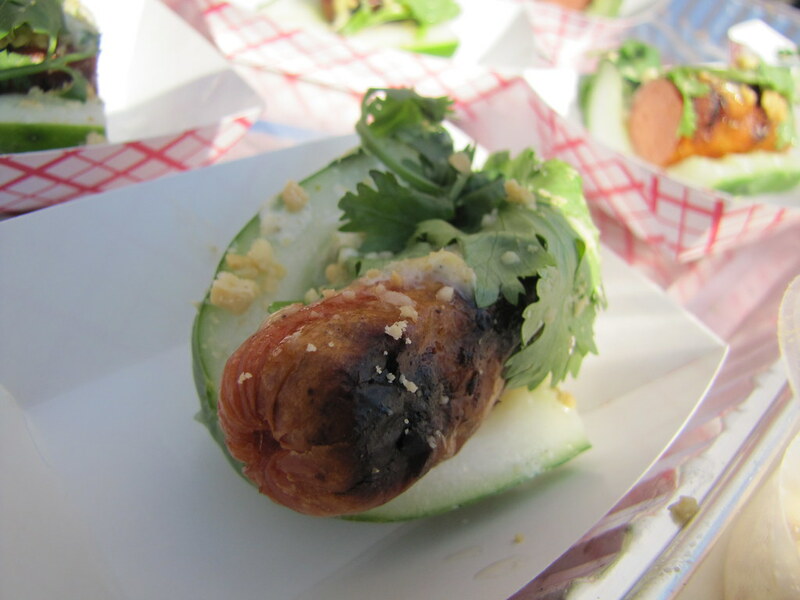 And there were twenty wildly different hot dogs on display from the contestants — including mine, a green curry mayo-slathered cucumber dog. I thought that a crisp, cold cucumber would be the perfect vessel for a hot, greasy grilled frankfurter in the middle of summer. They’re also abundantly in season right about now, and as it turned out, Eagle Street Rooftop Farm had a bumper crop of cukes at the very same time the cookoff was to take place. Not having any idea of my plans, its farmer Annie Novak asked if I needed cucumbers for anything: “I have too many!” she cried. Nichelle Stephens made an “English Breakfast Dog” with bangers and bacon. 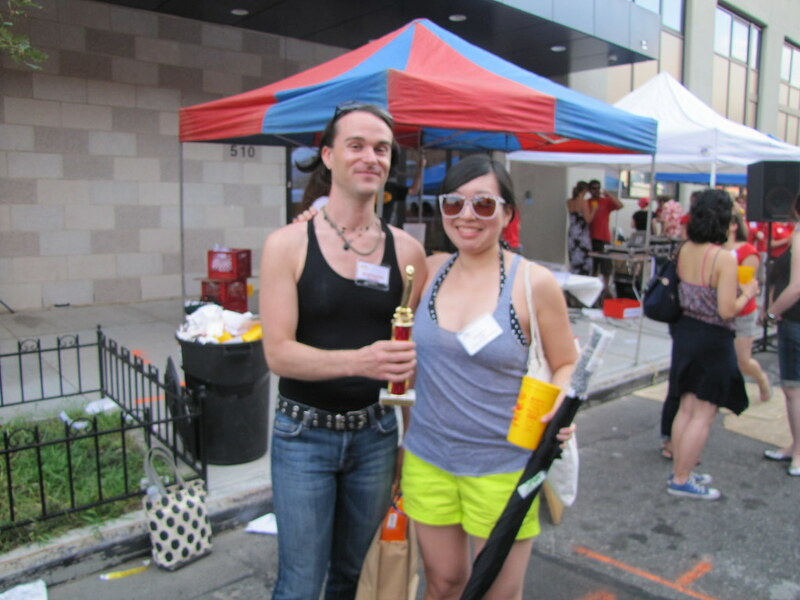 Karol Lu and teammate David Roderick made a Fried Pickle to the Slaw-ter Dog with coleslaw and a cornmeal-crusted fried pickle for garnish. Ben Stein and Arin Kramer stuffed the insides of their hot dogs and called it a Tur-Dog-En. 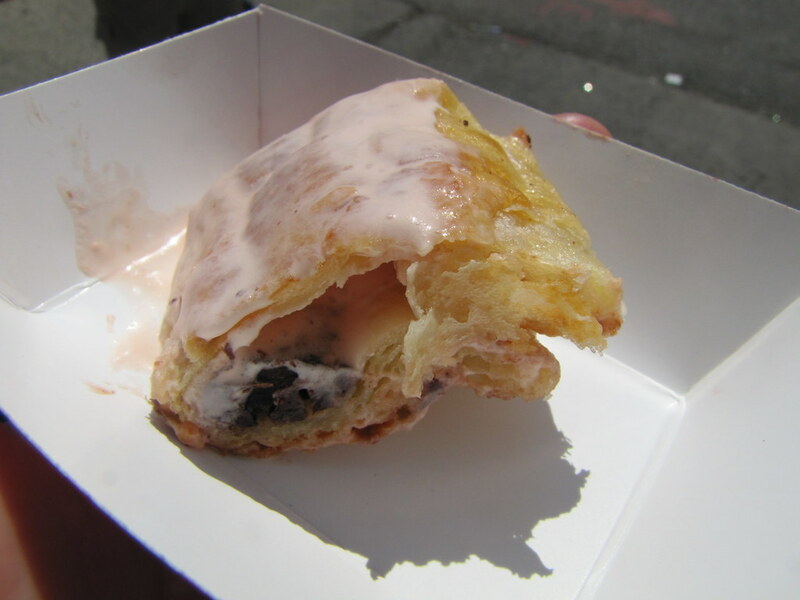 Noah Berland made plum ice cream and served it on a homemade pain au chocolate (that’s a flaky, buttery chocolate croissant) “bun.” It had no hot dog to speak of! Erik Michelson (not pictured) made a Swahili Dog inspired by his recent charity mission in East Africa, with spicy pickled lime sauce and homemade flatbread. 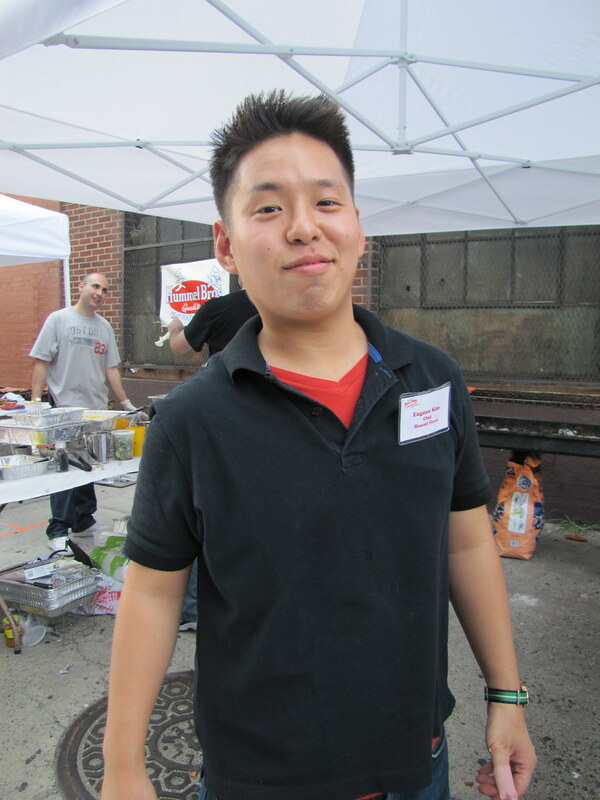 Two–time winner Eugene Kim made something excellent that was all gobbled up by the time I got to it. 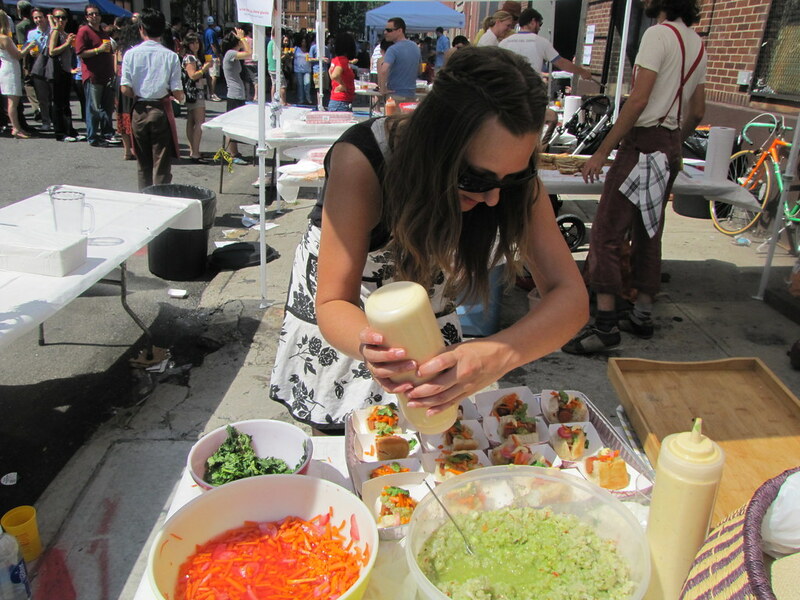 Lots of people made hot dogs involving guacamole this year. I think about five folks had this idea! That was a very quick run-through of the other dogs, as I was too steeped in my own grilling/cucumber assembly operations to get a full survey. 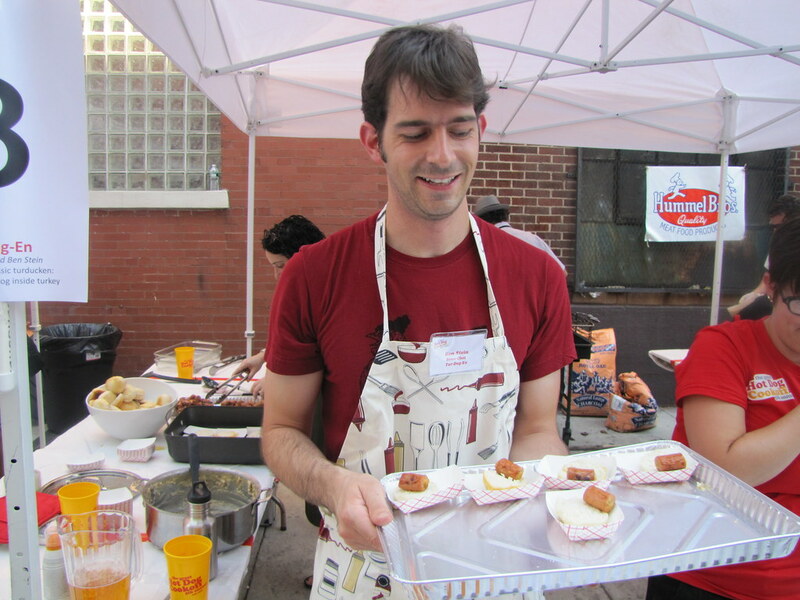 As with previous years, contestants grill their hot dogs on location, and garnish them up and cut into bite-size pieces on the spot. Each entry is made before the attendant’s eyes, creating a fun spectacle, and lots of sweat. There are two rounds of this, with ten contestants in each one, so never a dull moment at the event. I had the misfortune of inheriting the same station that Noah and teammate Shunya had used in the first round, which was utterly trashed with melted ice cream and chocolate. Thanks to the many kind volunteers who cleaned up all this crap befrore I got started. A three-year veteran of this cook-off, Karol finally got her revenge. 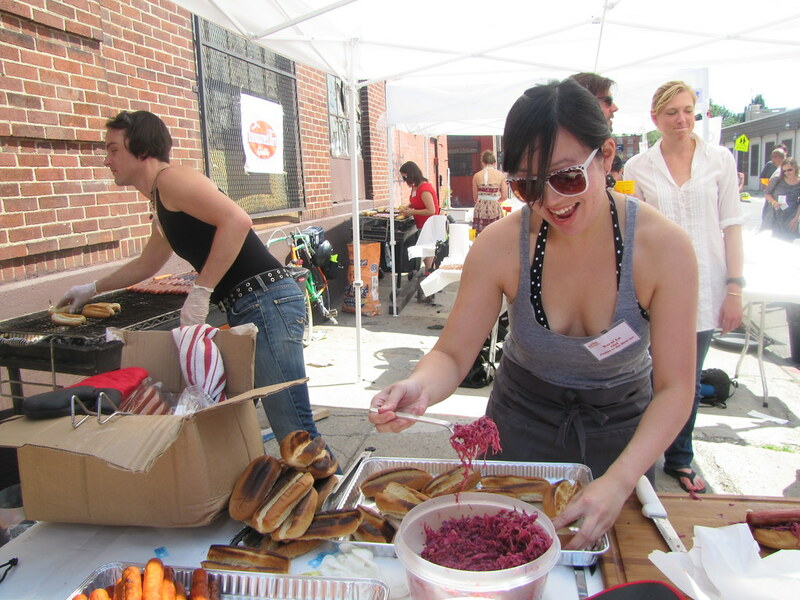 This is one of the hot dogs that I actually got to taste, and Karol’s vinegary red cabbage coleslaw is just killer. The Southern-style fried pickle is totally David’s latest obsession. Combined, a perfect pairing, and a winning team. Congrats, guys. 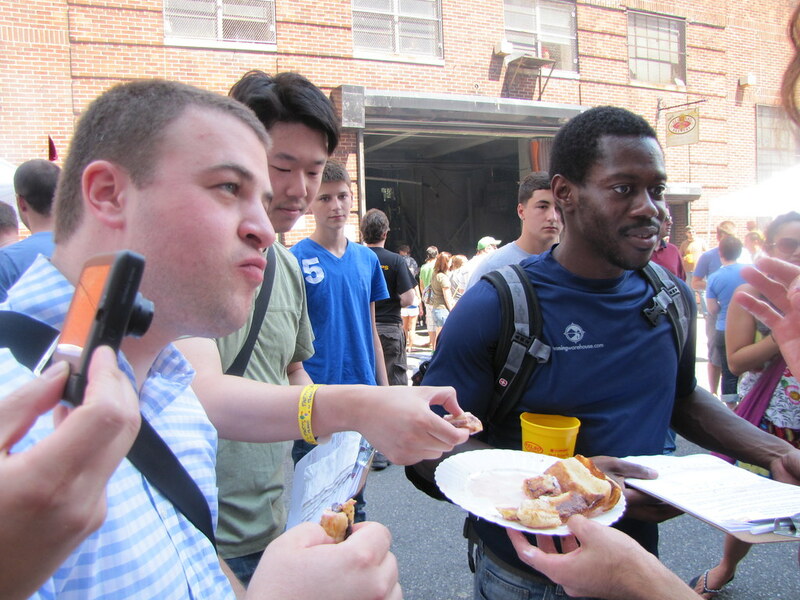 And let’s host another Food Obstructions soon — one of the five rules: must have a hot dog? In the meantime, here’s my recipe for that cuke dog. Go crazy with it! Halve the cucumbers lengthwise. Using a spoon, scoop out the seed pocket completely. Chill until use. Combine the mayonnaise and green curry paste and about half the juice of the lime. Assemble dog: place hot dog inside the cucumber. Squeeze the cury mayo on top as you would ketchup or mustard. Sprinkle with crushed peanuts, add the cilantro sprig, and squeeze a squirt of the lime. Enjoy! Five brownie points: The lone vegetarian in the crowd that I knew of was looking around asking, where’s the veggie dogs? Who made a veggie dog? No one at the cook-off did. But there was an ice cream dog, and there was mine, which certainly had a vegetable. You could say this is also a low-carb hot dog, since there’s no starchy bun to speak of. I just thought it was yummy. 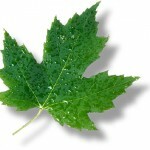 Five maple leaves: Half and half. I used Annie Novak’s Brooklyn rooftop-grown cucumbers for this, which are pesticide-free as well as grown with love. She even delivered them to my door while making other errands. The hot dogs were donated by Hummel, and we can’t thank them enough for their generosity. But they were conventional hot dogs. I really hope you do! And you’ll have to sign up next year! Hi there! I read your blog and I was at the hot dog cook-off but I didn’t put two and two together until right now! I LOVED your hot dog and I’m thrilled you posted the recipe! Thanks! I love it! 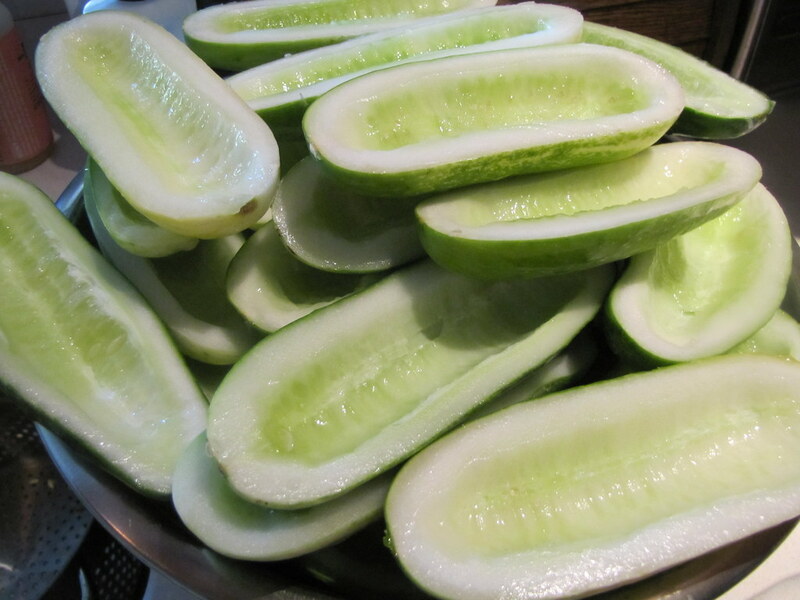 What a cool idea to use the cucumber as a hot dog bun. I always have veggie burgers at cookouts, but this seems like a great way to infuse some more veggies/nutrients into our BBQ. I bet the green curry mayonnaise would be great on fish too! Hawk food New York style looks very interesting! Thanks for sharing the cucumber love.